I decided to write a RAP to thank all 4K+ of you guys who voted for me to get my own billboards all across New York City with the Badoo Project! And thanks to Badoo for all the love! Badoo, Badoo, Badoo-oo-oo-oo-ooo-oo-oo-oo-oo — Badoo! Have some of this, some of that, be our guest! From Broadway to the Met, even b-ball! All of you folks at Badoo rule! Their face all over the city, that’s cool, yeah, fo’ sho’! And the biggest thanks of all goes to you, Badoo! This year, I’m aiming for a finish time of 4 hours, beating my personal best from last year’s marathon of 4:34:33, which was 37 minutes faster from my previous personal best from the year before in 2010 of 5:12:17. This sounds crazy ambitious, but I’ve been challenged by my friends who think that I can do it. As long as I stick to my running schedule (which includes running when I really don’t feel like it), I should get as close to the 4 hour mark as possible! Hey, that’s not bad for a girl who once weighed 240lbs and couldn’t even run HALF a block DOWNHILL! 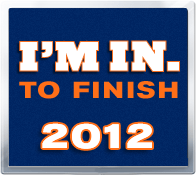 Looking forward to running the ING New York Marathon on Sunday, November 4th, 2012! It’s ON!! !